Gaiety School of Acting will host an Open Day for prospective students on Saturday 16th December. The Open Day gives students the opportunity to visit the school, see the facilities and meet tutors and staff. 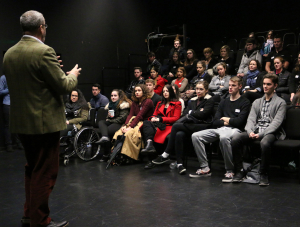 In addition to this, Open Day attendees will get the chance to take part in workshops in Voice, Movement and Acting, while mingling with current students on the full and part-time programmes. This entry was posted in Academic, Extracurricular, Guidance & Counselling. Bookmark the permalink.